Bobby believes that building a strong mind can change every aspect of a person’s life, and that the fastest way to do that is in the gym. The physical stuff you deal with in a workout is the easy part. Facing your own mind can be a bit (a lot) more daunting. You can do everything in your power to be a good husband or wife, son or daughter, father or mother, but things may still not work out. However, when you face your demons in the gym, when you are in the middle of a workout and want to give up…and you don’t…you become better. Mentally hard workouts are basically guaranteed to improve your life in a way that eventually seeps into every aspect of life. 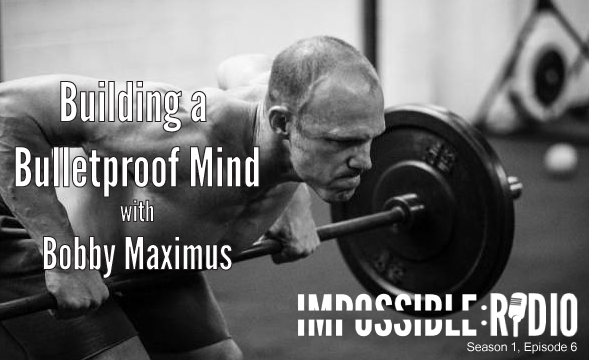 In this episode of Impossible Radio, Joel and Bobby talk about what it takes to build a strong mind, the incredible value of physical training, and what you can do to improve yourself in a hurry. (hint: you’ll probably be “moving” a lot, while at the same time, not “moving” at all. Tune in to today’s episode…it’s bound to change your perspective.